How to burn up 15,245,530 calories…apparently. So, with very tired legs I set off early on Sunday morning to do my 11 miles. Come what may, I was going to finish them. Sometimes I’m too bloody determined for my own good. But sometimes, as you’re trudging around the circuit, that determination is the only thing making those legs work. Certainly on Sunday my legs had no go. They felt sore and stiff from the start. Clearly I hadn’t had enough Guinness. I rarely see wildlife on my runs, even though I live in the countryside, but this morning I was initially joined by a beautiful fox who ran ahead of me in the road with its gorgeous bushy tail acting as a rudder as it ran from one side of the road to the other. It darted up the embankment at the railway line and was well hidden by the time I past by. Seeing such beautiful creatures running with you fair warms the heart; sadly most of the foxes I see are lying dead on the roadside. Much like the baby mole I found further up the road. So very sad. It took ages to get into any kind of stride. I almost regretted starting out. My first circuit of 5 miles was tough, really tough. Far worse than any other run I’d been on. I was too weak. My splits are all over the place and that probably reflects my state of mind as I was running. To make matters worse the clouds or possibly my new waterproof armband were stopping me getting a good GPS signal and I started getting some spurious reports of distance and pace. I got to mile 3 in 34 minutes, so Runkeeper announced, but I knew that mile 3 arrived a good few hundred yards earlier, having run the route many times before. I popped home after circuit one to fill up my water bottles and say hi to hubbie before setting off again knowing that one circuit was just shy of 5 miles. My app told me 4.2 miles. Then, not long after I’d set off, it jumped to 5 miles. It continued to do this all of the rest of the way round, jumping at one point from 7 miles to 10 and reporting a pace of 4 minutes. In my dreams I am a Kenyan! I tried every diversionary tactic I knew. I looked at the scenery. I counted. I joined in with my running tunes. It was hard going, but I was going to do it! However, despite the GPS problems, my second lap was far easier. Yes, I was tired, but I was running more smoothly and much faster. Maybe it was helping that I was trying to work out where exactly 11 miles would finish. I knew that my lap was just under 5 miles, so two laps would be about 9 ¾. I needed to find a mile and a bit. I decided that I would run to the road end and back, hoping that it would be about 11 miles. As I reached the end of the run my app told me I’d run nearly 13 miles. I finished in just over 2 hours. If I was right I’d run a fairly good 11 minute mile pace. All I could do was get home and check the map to see what had gone wrong. Runkeeper has the fortunate advantage of being editable online. Once I’d uploaded my data I could see that the GPS had placed me a mile away on the A75, apparently making the two mile journey in several seconds! A click of the mouse and the extra marker was deleted and my data returned to normal. I couldn’t believe it. I’d run 10.98 miles – how much closer can you get without measuring? Sadly my splits and coaching times are out of the box. Time, I think, to treat myself to a Garmin. Calories burned 15,245,530 apparently but I’ll settle for wiping out my full English breakfast on my return! So, I’ve done a bit of running since my last post here. Not much, I have to say, but something to write about anyway. Three runs since my last LRE run, one alone and two with hubbie. The first was an escape run. Sometimes I need to run alone and so I choose a time when hubbie isn’t home or just can’t do it. Don’t get me wrong, I love running with him! It’s great that he’s chosen to train up so that we can run together, but without a doubt he slows me down. I have to run at his pace and his pace is what I was doing last year. In the back of my head I’m worried that if I carry on running at his pace my speed will suffer. It’s bound to, surely? So now and again, and with his full support, I go alone or he accompanies me on his bike. I headed off into the woods with Murphy, my Jack Russell. He’s a great wee runner, tiny legs and huge enthusiasm! I love being able to take him with me, which is maybe why I love running this route so much. Seeing his little legs racing away and his tiny tummy nearly touching the ground as they do warms my heart. He loves running too and it’s great to share my love of the woods with him because hubbie isn’t as keen on the unstable surface! It had been raining heavily and so I didn’t quite know what to expect as I headed into the trees. It wasn’t quite as bad as I thought it might be, but bad enough to slow me down. Sometimes I think I should just leave my iPhone at home and forget about timing these trail runs; they really are a heck of a lot slower than a road run because of the nature of the floor! Rocks, ruts, mud, roots, branches – you name it, it’s there! I managed 2.38 miles in 27 minutes. Not bad. 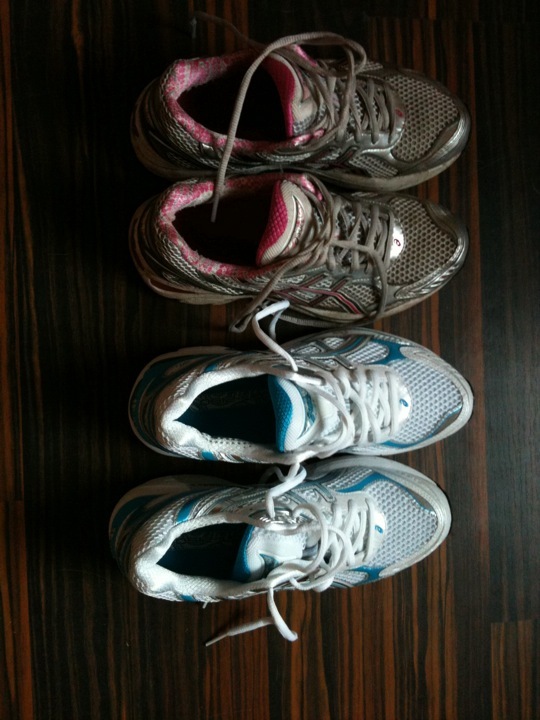 A couple of days later hubbie and I set off for a 30 minute run as part of my half-marathon training. In my new shoes :o) Pause for photos of said new shoes! I’ve been saying for a while now, mostly out loud so that hubbie could become accustomed to the idea, that once I hit my 300 mile/500 km target I would treat myself to a pair of new runners. I decided that I would stay with the Asics brand that has done me so well over the last year and even stick to the same model, the GT-2150. I need some support as my running style is “awkward” to say the least! A slightly twisted right leg makes me run in an odd fashion and puts some strain on my knees and ankles and the GT-2150 has helped even that out, to some extent. Knowing that I was sticking to a particular shoe made shopping easy; I just Googled GT-2150 and waited for the cheapest option. 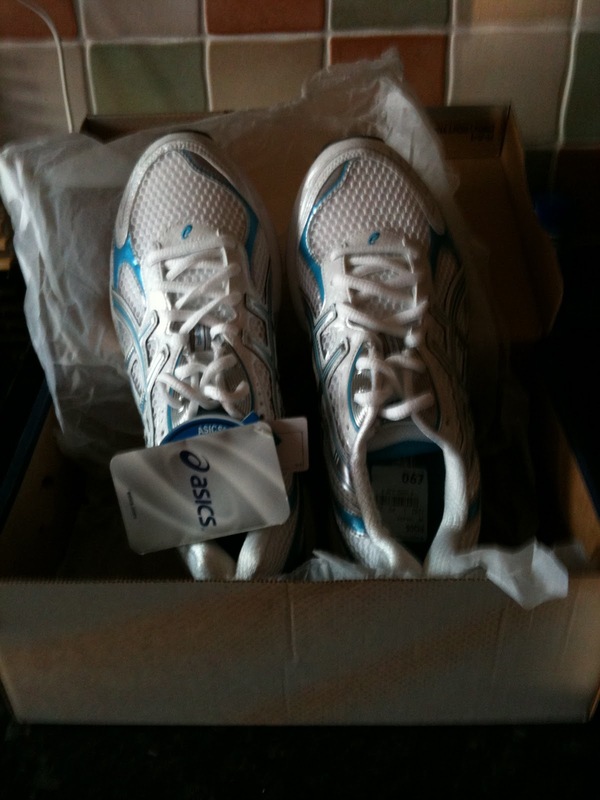 Good ol’ Debenhams department store had a half price offer on and my Asics were purchased at a bargain basement price! Making everyone happy!! It was a bit blowy, nothing like it was last Sunday, but we set off at a decent pace. Unfortunately it was too decent for hubbie and he soon started to flag, even with walk breaks every 4 minutes. When I see him run I realise just how far I’ve come in a year. I backed off the pace a bit just so that he could last the distance. With the wind in our faces on the way back we were desperate to turn the corner leaving the wind behind. It’s amazing how strong a force Nature can be when you are against it! 2.55 miles in 29 minutes and one exhausted husband! We went away at the weekend to a car show at Sunderland Hall in the Scottish Borders. It’s a couple of hours from where we live and just a couple of miles out of Selkirk. It’s a really nice place. Normally. On Friday when we arrived it was raining. Raining hard. And we were camping in a field. We drove in, the last two cars to drive in under our own steam; everyone else had to be towed in by a tractor. And there we stayed for a couple of days. On Saturday I had a 4 mile run to do. It was sunny but nicely cool so I was happy to run. As hubbie had successfully managed a 4 mile run the Sunday previous he decided to come with me, provided that I left my new trainers in the caravan and ran with walk breaks (apparently my new trainers are sprinkled with fairy dust and make me **faster** how great is that?) I agreed and we set off for a there and back run, basically because we didn’t know the area well enough to plan a route. We were to run alongside the River Tweed, which should have given us a fairly flat route. Should have!! First of all we had to scale a fence with barbed wire in order to avoid the twelve inches of mud at the field gate. That was when I gained my first trophy nick. Great, bloody shins before I started! We walked to the main road, the A7, and then started to run on the path alongside it. We were spoilt by the luxury of having a path to run on; usually we have to run on the road, dodging cars, lorries and tractors. This was heaven. I noted that the outward run was slightly uphill, however hubbie decided it couldn’t be as we were running alongside the river. Until we reached the bridge which we had so obviously been climbing up towards! The path crossed the main road and went off down a side lane, still alongside the river but on the other side of it. It was so pretty. We had a fairly even 11 minute mile pace with the walk breaks. In between walk breaks we were running at about 9:30 – 10 pace. I wish I’d taken photos of the route, it really was lovely. Not as flat as we’d hoped, take a look at the elevation chart! The hills look horrendous, but they are basically 30 foot climbs – still enough to slow us down a wee bit. We kept a fairly constant pace, although coming down the final hill I decided to crank the pace up a little bit. Not too much that I might lose hubbie, but fast enough to give us a final push. We completed the 4.02 miles in 47:58 (11:57 pace). Climbing back over the fence gave me another shin nick on the wire, but at least I had another 4 miles under my belt in one of the loveliest places I’ve run for ages. 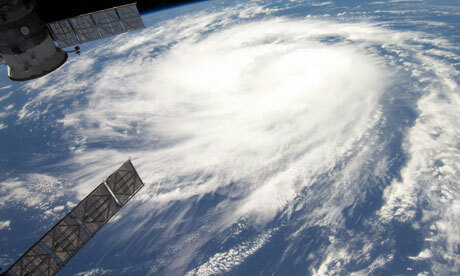 Yesterday I said that I was battling against the remnants of Hurricane Irene as I did my LRE. What boff! It is Hurricane Katia and all I can say is that I am SO glad that I chose to run yesterday and not today! …and look to the left of Carlisle about three millimetres and that’s where we are! I’m in and I’m staying in!! Hurricane Irene hasn’t been in that much of a hurry really. Today what’s left of her has been battering the west coast of Britain and, more specifically, my bit of the west coast. Despite it being hubbie’s birthday I’d decided that I needed to get this run out of the way, another LRE (Longest Run Ever) of 9½ miles. Hubbie gave his permission and even agreed to come round with me on my second lap which would be slightly less than the first but still a good mile and a half longer than he’d ever run. I was fairly confident that the Galloway Run-Walk-Run system would allow him to do this without feeling too tired. After gearing up with jelly beans and sports drink I headed off into the drizzle for lap one. As per usual the first mile was the hardest, all up hill and leaving my (asthmatic) lungs little time to open up. As I ran up the hill I wondered if the water running off my face was sweat or rain. It was warm, humid and wet all in one big weather front! Thankfully the wind was behind me up the hill. That, however, was about to change! I was running around an 8 minute mile pace and then taking my walk breaks every 4 minutes which slowed my overall pace down to 10 minutes. I knew that was maybe a wee bit too fast for me considering that this would be the longest distance I’d ever run and so I slowed it down just a little to around 9 minute mile pace. That meant I was doing 11 minute intervals. Great. Spot on for me to last the distance and so much faster than I was running just a few months back. I really don’t know where my speed has come from, but I’m delighted to see it and also know that I’m holding back! I think that maybe the 5k training programme I did, with all the interval training, has really helped and I’m thinking of incorporating that into my regular routine once I’ve achieved my longest distance of 14 miles. The wind and the rain were pretty full on. I was buffeted from the side and then head on as I ran home. My face was being distorted by the force of the gusts, it really was that bad. Undeterred I plodded on, wading through puddles that covered the road and ignoring the fact that my clothes were soaked from rain rather than the usual sweat! I made 3 miles in 33 minutes. Perfect! I was particularly worried about my iPhone as I could see moisture starting to eek under the protective cover through the earpiece hole. I’ve taken to wearing the armband upside down so that the unprotected earpiece and on/off button are pointing downwards and should be less likely affected, but today I’d have needed to put the whole thing in a polybag if I was wanting waterproof! The last hill before I drop back into the village is always a bit of an ordeal rising 20 feet within two tenths of a mile. With the wind in my face it was even worse! I reckon the conditions alone will have been worth an extra half of a mile! I ran through the village and into the house. 4.89 miles for my first lap. I grabbed a loo-stop and quickly taped up my phone as best I could before setting off for lap two with my incredulous husband “It’s raining!” he announced as he stepped outside. “Tell me about it!” I replied. It was, by then, steadily raining. My husband has, so far, only run 2½ miles on his C25K training and was taking a bit of a chance coming with me for a 4 mile run. I tried not to slow down too much for him. I was sure that he could manage 11 min/mile pace if we were using the Run-Walk-Run method. He did extremely well, although he said himself that the last 2 miles were really hard work. I don’t think that I’ve ever been prouder of him. We didn’t really talk much. I was pretty tired by the second lap and focusing on the fact that I had another 4½ miles to run. We managed some chat on walk breaks over some rather soggy jelly beans. We maintained the 11 min/mile pace pretty much throughout the run, although that last hill was a killer on lap two. BOY OH BOY!!! Once I reached the top of the hill I knew that I had just a half of a mile to go, so I sprinted, leaving hubbie behind! By the time I reached the bottom of the hill I was just over 7 minute mile pace and loving it! I ran out of steam just as Runkeeper announced 9½ miles. My LRE is, therefore, now 9½ miles, achieved in 1:48:38. My overall pace was a fairly consistent 11:26 which, as my husband put it, is F***ING BRILLIANT! I finished off my run with the dreaded, but so necessary, cold bath. I think I might be getting addicted to my cold bath; I find it ever so slightly wonderful after a long run. What’s next? Feet up in front of the telly. Thank you very much! As I lay awake last night between 2 and 4 I was planning this blog in my head. That, people, is called dedication to the cause. Or insomnia. Yesterday evening I ran my first 10k road race here in Dumfries (the one in Scotland before anyone asks!) It was organised by the Dumfries Harriers, very well organised I have to say, and took us out of the town and around a local industrial estate before bringing us back in to complete a half lap of the track at the David Keswick Centre. I was nervous and had joked all day that I was going to be last probably in an effort to buoy myself for disappointment if I was. I know all the sayings us runners bandy about (Finished Last > Did Not Finish > Did Not Start and the such like) but the truth is no one wants to be last. I didn’t, but I had looked at previous year’s results and knew that it was a distinct possibility. My PB for a 10k was 69 minutes. Some of the guys yesterday were discussing finishing their 10k in under 30 minutes. That’s just beyond my comprehension at the moment! My husband and son and wee dog came along as supporters. We found people we knew which settled me down a bit before the start and on the start line I found someone young enough to be my daughter (and obviously vastly more experienced at racing) to chat to. I find that finding a friendly person to chat to just makes me calm down. The start was announced by the drone of bagpipes and I set off with the advice of my good friend Paul ringing in my ears: “Go steady.” I had set off near the back because I didn’t want to be in anyone’s way, but I was soon overtaking runners. Running the Jeff Galloway Run:Walk system means I have a faster pace than those running right through, but then have to stop and walk for a bit. I tried to keep my pace to around 8.30 minute miles which, with my walk break, would come out at about an 11 minute mile. That, over 6 miles would be about 66 minutes, four minutes faster than my personal best on the road. Steady as she goes. Embarrassingly I seemed to hit walk breaks whenever there was a steward nearby who immediately started encouraging me to run! I had to keep explaining what I was doing and, after I got a thumbs up of comprehension, I’d be away. The miles came easy, I have to say. I was running on a far flatter route than I am use to. These lucky town dwellers! However, my training had given me that extra bit of strength. In front of me, rather annoyingly at times, were four Harriers running side by side. They took up the entire width of the road and I got the impression that the guy running with the three women was a trainer. Several times I caught up with them but couldn’t get round them without going all the way round them! Had I have overtaken them near the start I don’t think they would have caught me up before the finish as I was on their heels through the finish gate. Running in twos, yes. Running in fours, I think, is a bit of a no-no. I was pleased to see that at the start I was running an overall pace of 10 minute miles. In the back of my head I wondered if I was pushing too hard, having all these people round me. I maybe slowed a little at mile 3, just wanting to finish well. Mile 3 came at 31 minutes. That was good and I was happy. The stewards along the course were superb, as were the members of the public. Clapping and cheering the runners on even though it had started to drizzle and, by the time the back runners were going past, it was getting dark. As I ran towards the stadium I caught sight of my husband and son with huge grins on their faces. They knew I was on for a PB and they shouted encouragements as I headed onto the track. In front of me, again, were the four Harriers. Tempted as I was to try and sprint past them on the straight, I held back. I just wanted to finish and, chances are, they would have sprinted as well. I finished feeling strong in 65:10, a full four minutes inside my PB. And I wasn’t last!! Result!!! 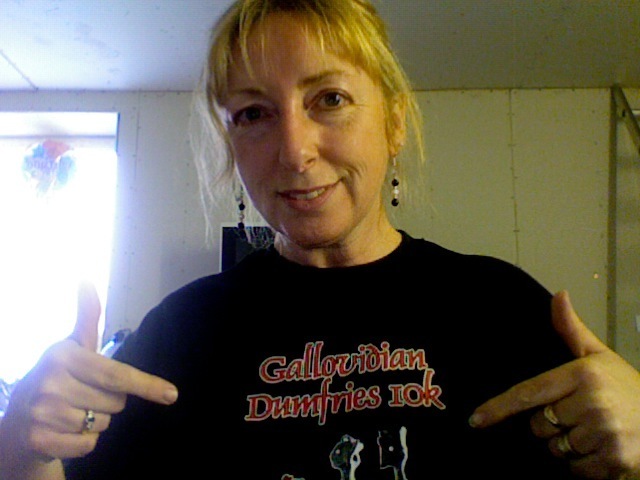 As I sit here typing I am wearing the excellent t-shirt I received as a finisher with Gallovidian Dumfries 10k 2011 emblazoned on the front. I am very proud of myself. EDIT: My official time was 65:29 according to the Harrier’s website, but as I didn’t cross the start line until a smidge afterwards I’ll stick with my Runkeeper time! Cross training – what do you do? I’ve done a bit of cycling, a bit of swimming, a bit of yoga and some Tai Chi. In other words I’ve pretty much tried everything and not got into a routine of doing anything in particular, which is pretty typical of me. Left to my own devices I am not very dedicated. This is why I’m following a half-marathon programme now without a half planned! Without the push I’d be running 3 miles every day and not really doing much else. I need something to aim for. What I should really do is go to a class and make myself a regular commitment. That I know I’d keep because I hate the thought of folk saying “Oh that Julie, she never sticks at anything!” My commitment has to be public. Maybe that’s why I blog? I do have one commitment. Since before our marriage in 2002 hubbie and I have been ballroom dancing. We go weekly (at one time we went twice weekly) and the original idea was that we should learn a dance for our wedding First Dance. We learnt a Parisian Rumba, which is lovely, and then we just kept going because we liked it so much and had met some really lovely people. We moved house four years ago, another 10 miles from the venue which was already 20 miles away, and changed jobs which stopped us from attending, but a couple of weeks ago I remade the commitment (and then told my husband)! We now attend a weekly dance class and for the last couple of weeks have been learning a sequence jive. It is harder than it sounds! A total cardiovascular workout requiring total concentration and a sense of humour when it all goes horribly wrong!! We do love it though. I now have to disappoint you and tell you that neither of us wears spandex, lycra or sequins! Half the time I turn up in jeans although I do have several pairs of dancing shoes (black, gold and silver) and a few “frocks” to wear to the balls. So, my cross-training of choice is ballroom dancing! A low impact workout with a few frills. And, by the way, I can do a mean Dirty Mambo!